Arianespace has successfully launched satellites 19, 20, 21 and 22 in the Galileo constellation, using an Ariane 5 heavy launcher on behalf of the European Commission (DG GROW) and under a contract with the European Space Agency (ESA). The launch took place on December 12, 2017 at 3:36 p.m. (local time) from the Guiana Space Center (CSG), Europe’s Spaceport in French Guiana. Today’s launch was the ninth from CSG for the Galileo satellite navigation system, and the second using the Ariane 5 ES version of this launch vehicle. Arianespace has now orbited a total of 22 Galileo satellites, using Soyuz and Ariane 5 launchers. 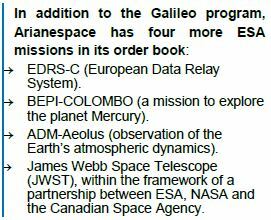 A last Ariane 5 ES will orbit four more Galileo satellites in 2018, then Ariane 6 will take over in 2020-2021. Today’s launch was the 11th and final of 2017 for Arianespace, and the sixth during the year for Ariane 5, which also marked the 82nd successful mission in a row for the heavy-lift launcher. Galileo is Europe’s own global navigation satellite system (GNSS). Under civilian control, Galileo offers guaranteed high-precision positioning around the world. Its initial services began in December 2016, allowing users equipped with Galileo-enabled devices to combine Galileo and GPS data for better positioning accuracy. The complete Galileo constellation will comprise a total of 24 operational satellites (along with spares); 22 of these satellites have already been orbited by Arianespace. Following today’s launch, the GSA (European GNSS Agency, in charge of managing and operating the EGNOS and Galileo satellite navigation systems for the European Union) will be responsible for operating these satellites as soon as they separate from the launcher. Satellite positioning operations and system operation will be carried out in conjunction with ESA. Today’s launch was the second this year for the European Commission and ESA, coming after the successful Vega launch in March (VV09) on a Copernicus mission. It also is the 11th performed by Arianespace for the European Commission, and the 56th for ESA, using its complete family of launch vehicles: Ariane 5, Soyuz and Vega. In September, the European Commission and ESA chose to continue deployment of Galileo satellites with two Ariane 62 launches, making them the first customers for Ariane 6 and clearly confirming their commitment to this next-generation heavy launcher – while also reaffirming, more strongly than ever, Arianespace’s mission of providing Europe with independent access to space. With this final launch of the year, Arianespace maintains a sustained pace of operations. It performed 11 launches in 2017, all successful: six by Ariane 5, two by Soyuz and three by Vega. Arianespace launched 20 satellites for 18 different customers, with total weight injected into orbit of nearly 60 metric tons, including 53.8 metric tons just for satellites sent into geostationary transfer orbit (GTO). Shortly after the announcement of the orbital injection of the four satellites, Stéphane Israël, Chief Executive Officer of Arianespace, said: “With this sixth successful Ariane 5 launch and the second mission for the European Commission and ESA this year, Arianespace is proud to guarantee Europe’s reliable and independent access to space. “I would like to thank the European Union and, in particular, DG GROW, along with the European Space Agency – our direct customer on this launch – for continuing to trust us with their missions. This successful launch of four additional Galileo satellites marks our ninth mission for the constellation, which supports applications that will benefit the population at large, bringing the total to 22 satellites in orbit. 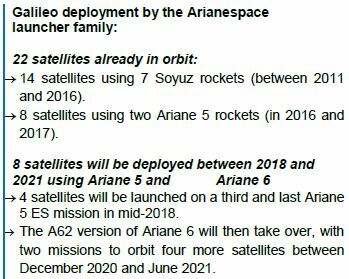 A final Ariane 5 ES will embark four additional satellites in the summer of 2018, before Ariane 6 takes over from the end of 2020. My thanks also go to OHB, which built the satellites launched today. The Galileo FOC-M7 satellites 19, 20, 21 and 22 were built by prime contractor OHB System in Bremen, Germany, with the payloads for each satellite being supplied by UK-based SSTL (Surrey Satellite Technology Ltd), 99% owned by Airbus Defence and Space. Each satellite had a liftoff mass of approximately 714 kg., for a total mass of 2,860 kg. They were placed into a circular medium Earth orbit (MEO) in Plane A, at an altitude of 22,922 km. and an inclination of 57 degrees. They will subsequently be moved to their operational orbit at 23,222 km. Arianespace uses space to make life better on Earth by providing launch services for all types of satellites into all orbits. It has orbited more than 560 satellites since 1980, using its family of three launchers, Ariane, Soyuz and Vega, from launch sites in French Guiana (South America) and Baikonur, Kazakhstan. Arianespace is headquartered in Evry, near Paris, and has a technical facility at the Guiana Space Center, Europe’s Spaceport in French Guiana, plus local offices in Washington, D.C., Tokyo and Singapore. Arianespace is a subsidiary of ArianeGroup, which holds 74% of its share capital, with the balance held by 17 other shareholders from the European launcher industry.